In a mixing bowl blend together the butter and sugar into a smooth paste. Sift the flour with the baking powder and salt and then add to mixture, blending well. Add the lemon extract one tbs. at a time, blending until smooth. Slowly pour in the milk, blending until smooth. Pour the batter into a round cake pan prepared with thin layer of butter and sprinkled with flour. Bake for 65 minutes or until golden on top and an inserted toothpick comes out clean. Allow to cool completely before gently removing from pan. Also last week, we had a couple guys around replacing the old planks of our deck. This, because my husband’s knees are officially retired. Usually when we need work done he will ask for a recommendation. His friend, who once poured some concrete for us, warned him that he knew some guys but they were white, to which my husband replied that he didn’t care as long as they could do the job. Apparently, when they arrived, they also had no qualms about working for a black man with a white wife. So, while discord and disagreement occur in other places, here it’s been all about getting the work done. 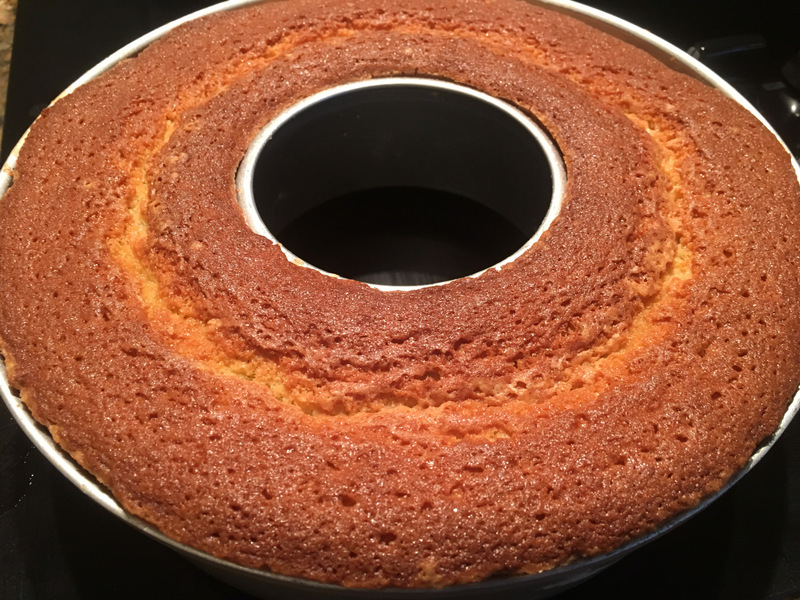 My husband brought them each a slice of pound cake around lunch time and they asked him to “thank mama.” When he brought them another slice the next day, they offered to buy all the ingredients if I would bake a whole cake for them. I keep all the ingredients in my pantry and get the eggs straight from the chicken coop. (They actually blend in to the batter better when they are warm.) And since I still had about four dozen eggs in my refrigerator I decided to bake a cake for them. I get the pure lemon extract and Happy Cow butter in two pound bricks from the Greenville State Farmer’s Market on Rutherford Road. I set out the butter for an hour before mixing the cake, so that it’s warm also. I get the organic raw sugar in ten pound bags from Costco. I use unbleached all-purpose flour, and aluminum-free baking powder. I replace the milk with un-chilled coconut milk. And since I rely on measuring cups and spoons, I think Bertha was the master among us. Her legacy lives on here in Greenville. Let there be Bertha’s Lemon Pound Cake for everyone! Maybe we could all get along.